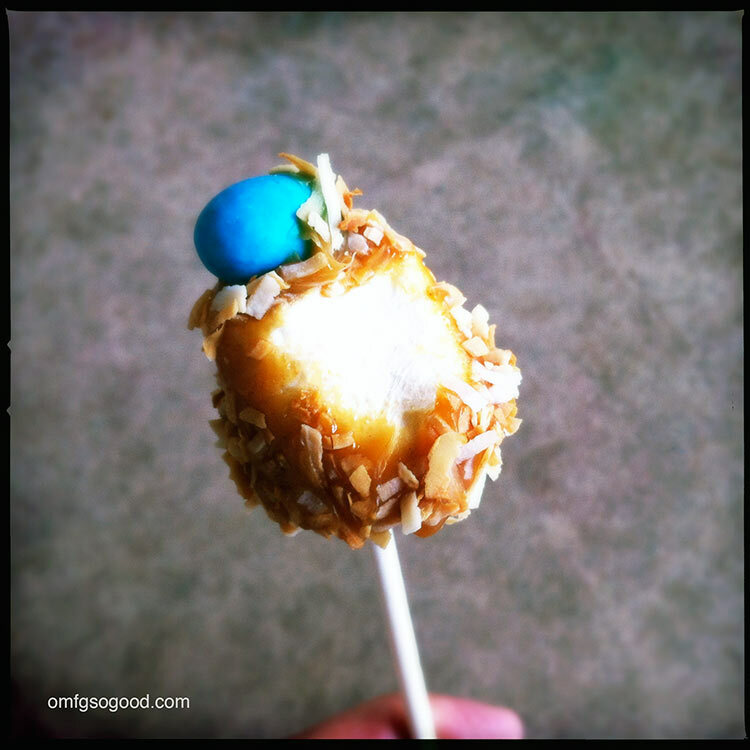 toasted coconut caramel marshmallow pops | omfg. so good. Well, I almost didn’t write this post because it’s two days before Easter and I probably missed the boat. Plus, these little bitties would be ding-dang tasty anytime of the year. Just leave off the little egg shaped candies. Or don’t. Be a rebel like me. Jab a cake pop stick into the bottom of each marshmallow and stick them in your fancy cardboard cake pop stand (or lay them on a sheet pan lined with wax paper) and set aside. Preheat the oven to 350 degrees. Spread the coconut in a single layer on a sheet pan and toast in the preheated oven for 10 minutes, stirring at the halfway mark to ensure even browning. Remove from the oven, transfer to a bowl and set aside. In a heavy saucepan over medium-low heat, combine the caramels, butter, heavy cream, cinnamon and vanilla. Stir until melted and smooth. Transfer to a heat safe (glass) bowl and set aside. 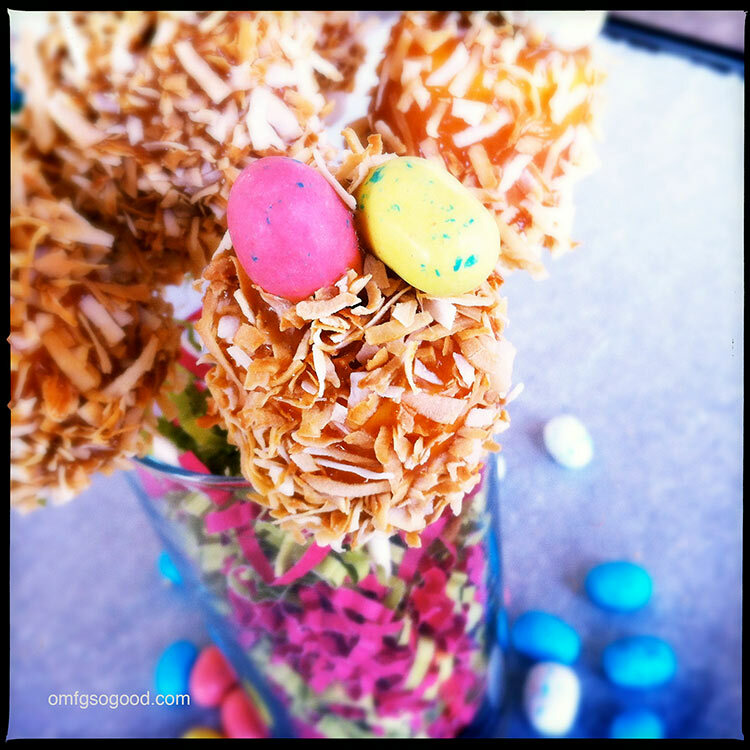 Roll each marshmallow pop gently in the melted caramel mixture then roll it in the toasted coconut, gently pressing the coconut into the caramel, to evenly coat. 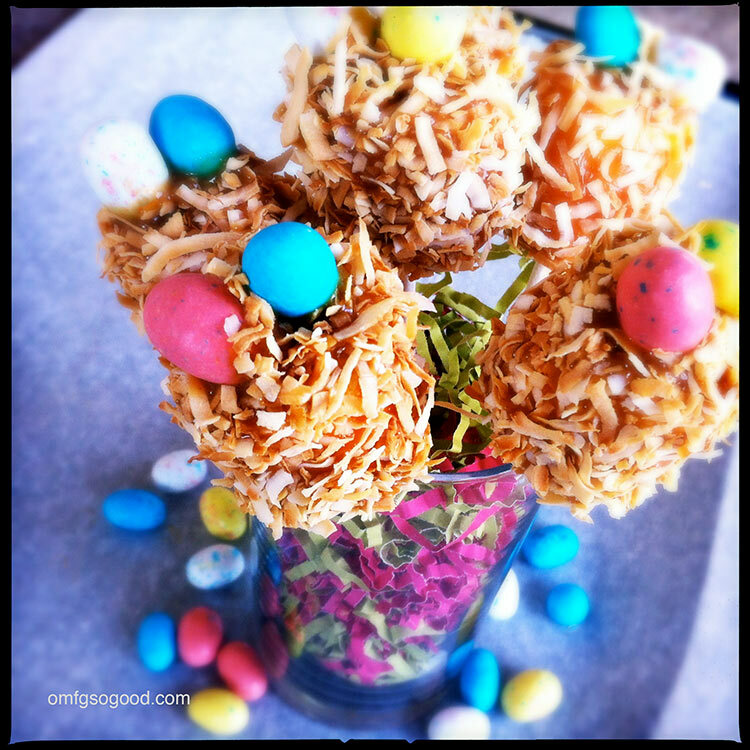 I thought they looked like tiny little bird nests on poles, so I decided to add some candy coated chocolate eggs. Which turned out to be a good decision. Hell, adding a little chocolate to pretty much anything is a good idea. These look amazing. I’ve been experimenting with home-made marshmallow. Next Easter I’m definitely giving these a try. Great pictures, absurd concept. Thanks anyway! Many of my recipes/ideas are kid-friendly, especially those themed around the holidays. Kids love absurdity. 🙂 Thanks for the feedback!